Donald Cifarelli currently lives in Carlsbad, CA, where he teaches Italian conversation gratis to seniors at the Encinitas Senior Center. He is a member of the YMCA and meets regularly with a group of seniors for coffee, conversation, and workouts. His interests include writing, playing the guitar and ukulele, cooking, and reading an average of a book a week. Life, Love, War, and the American Dream. Donald Cifarelli was born to be a soldier: he came into the world on March 4th, 1924-and in one way or another, marching forth is what he’s always done. At the age of four, he arrived at Ellis Island, and a year later, watched the American Dream tatter and fade with the onset of The Great Depression. 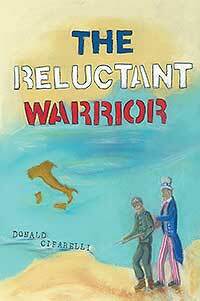 But “The Reluctant Warrior” is the memoir of a man who saw what he wanted in the great United States and embraced life in America with a full and open heart. This is the story of his journey from a colorful childhood as an immigrant in Brooklyn to assimilation into American culture, and the fateful day after the attack on Pearl Harbor, when he heard President Roosevelt’s “Day of Infamy” speech and knew that he would fight to preserve the freedom that was America’s promise. Along with the horrors of war in North Africa and in Italy during the final campaign that ended WWII, Donald unexpectedly found love, which had to survive long months of separation and uncertainty. After being reunited at the end of the war, the Cifarellis faced the task of rejoining everyday society, and struggling to find work and realize their dream of a home and family. Candid, detailed, deeply personal yet broadly relatable, “The Reluctant Warrior” is a vivid picture of the historical arc of the 20th century in America.